This is a caution--if you own pets, no matter how much you may hate politics, you can't afford not to pay attention to what is happening in your city, in your State, and in your country. You need to know when bills are introduced that will ban or restrict pet ownership, because if you don't know, you can't fight them...and pet owners have to stick together, because the forces against us right now are very wealthy, and they will divide and conquer if we don't help one another. Write in, call in, and make your voice heard when these bills show up. Internet petitions aren't good enough. Quite frankly I don't think you should be able to own a wild animal that can be a big safety hazard without a license. I don't think anyone should be able to keep a tiger without a permit lol. In fact, most tiger keepers would agree with that. Reasonable permits for keeping wildlife that is actually dangerous is an understandable rule. However, a lot of these anti-exotics bills coming down the pipeline want people to carry $100,000 in liability insurance just to own a ball python. Or, they ban the ownership of these animals completely, which really can't be justified. Not to mention, the groups pushing for these bans have explicitly stated their end goal is to ban pet ownership. For right now, they're just going after the low hanging fruit: things that scare most people. It is only a matter of time before they get around to demonizing the kind of pet you choose to care for. I understand why some people don't want others to own Burmese pythons and other animals such as tigers and chimpanzees, etc. If they get out, they probably would kill domestic animals and people, and harm the native species and environment. I respect that other people might disagree with me. I'm a big reptile fan--Urofan stands for Uromastyx fan. I currently don't have any reptiles, but I have owned them in the past. 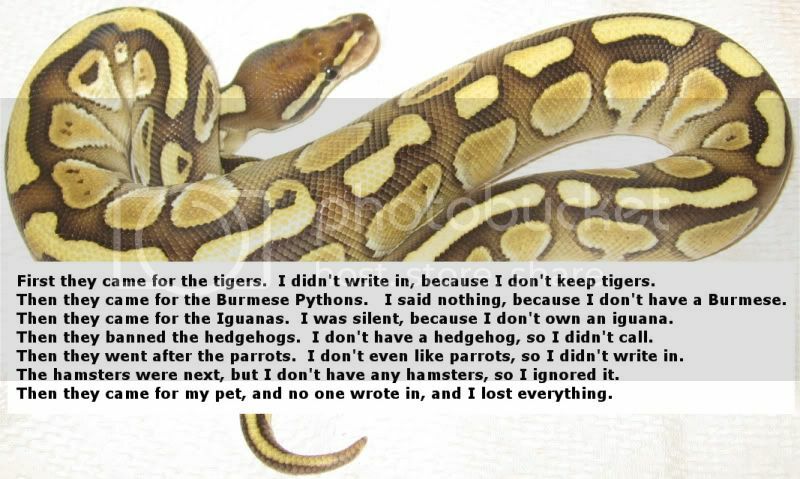 I understand that there are people who own reptiles and are concerned about all the bans. Well, the thing is, no one's ever been killed by a reptile outside of the owner's home, and there are scant few incidents involving any death other than the owner himself. The incidence is so low, it can't be considered anything other than an occupational hazard. Reptiles that have gotten outside? No deaths. Compare this with dogs--responsible for 30 deaths a year, or horses, that kill at least 26 per year. Reptiles? Less than one. So why pick on the Burmese python? You can't ban everything that might pose some threat to humans, or everyone would have to live in a padded box. Burmese pythons have gotten out, and do get out, on occasion. No humans have been harmed. A few poodles may have been eaten, but this is a rare incident, and hardly one that is any different from the risk of a small dog being eaten by a larger dog...or coyote, fox, bird of prey, etc. Many more small dogs and cats are killed by larger dogs, than even a flotilla of Burmese pythons could manage. That's no more a valid argument for banning Burmese, than it is for banning large dogs. Burmese pythons do pose a threat to the environment...of South Florida. But they are already there, and cannot survive anywhere else in the US. The winters simply get too cold. Preventing people from owning them elsewhere will have 0 impact on that South Florida population. The USGS report used to justify the rule change has been discredited by every herpetologist and scientist who has looked at it. A real study shows that they can't live outside of Florida, and potentially one tiny portion of South Texas. They simply aren't a threat to the ecosystem anywhere else in the country. The Lacey Act is being misused to enforce an agenda, and everyone should be angry about that. You see, the injurious species list was designed to prevent ecologically dangerous species from being transported into areas where they might establish. It was never meant to be applied to stop commerce in a species already present by the hundreds of thousands, and which is represented in every mainland State in the US. The snakes are already everywhere--so how can barring State transport prevent them from 'spreading'? It's a complex issue, but the basic point is, the Lacey Act is entirely the wrong tool being applied to entirely the wrong problem. This rule change can't do what it was claimed to be able to do. Instead, it's killing businesses for absolutely no reason whatsoever. It doesn't prevent people from owning Burmese pythons, you see. Only from taking them across State lines. Now, moving away from that particular ban...why would a State apply a ban to species that are kept so widely, by so many people? Bans like that only punish responsible keepers who won't break laws. The irresponsible people who might conceivably endanger themselves or household members will keep their animals illegally. Just like the person in Florida--the Burmese that allegedly killed the toddler was being kept illegally as well as improperly. Do you think that when Florida banned the Burmese python, everyone rushed to turn in their pet? Of course not. Most people probably kept them. People have an emotional attachment to their pets, you can't just say 'oh, turn it over so we can kill it now'. Not going to happen. Requiring licensing is a far more sane way to deal with the issue than a ban. Criminals will still be criminals, but that way, the good folks who keep these animals properly will still be able to do so. I absolutely disagree with punishing good people in a misguided attempt to curtail the bad ones. It doesn't work. Then, of course, one has to consider the animals themselves. Most of them are in good, responsible homes. If they are banned, they'll either be killed, or the owner will keep them illegally...and then be unable to get veterinary care for them if they need it. Who does that help? Certainly not the pythons...not at all. Where is the line to be drawn? As I pointed out, dogs kill a LOT of people...so why should they not also be banned? Did you know that house cats are responsible for more deaths than captive reptiles? More people die of septic cat bites every year, than are killed by reptiles. Why not ban cats, instead? They are clearly more dangerous animals. Make no mistake about it...once they're through banning the 'exotics', they will find reasons to justify banning everything else as well, and it will sound reasonable...to everyone who doesn't have that type of pet. Last edited by WingedWolfPsion; 02-13-2012 at 11:00 PM.